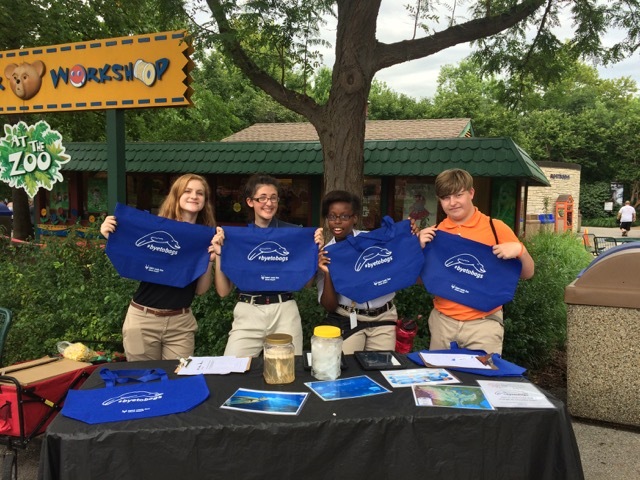 The Ocean Project > News > Blog Posts > ISG+ Update: Zoo-Alive teen volunteers at the Saint Louis Zoo take the #byetobags pledge and spread the word! 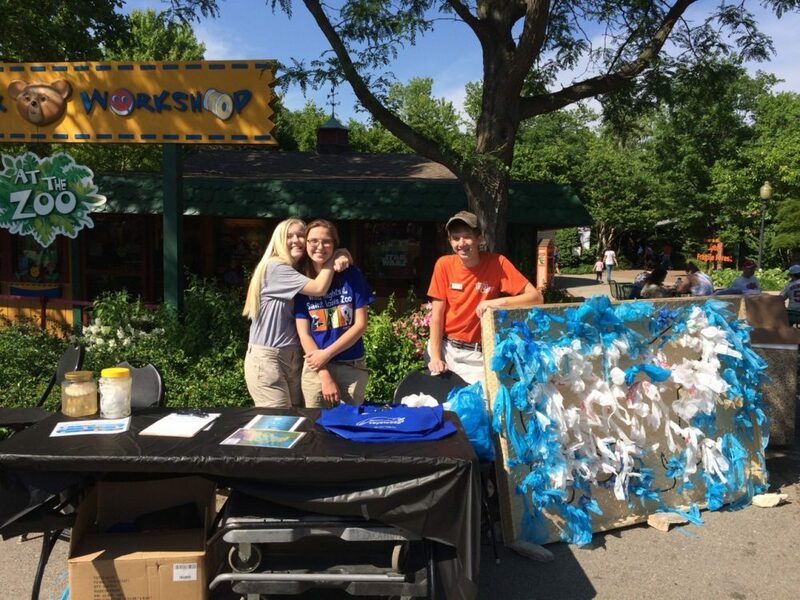 ISG+ Update: Zoo-Alive teen volunteers at the Saint Louis Zoo take the #byetobags pledge and spread the word! 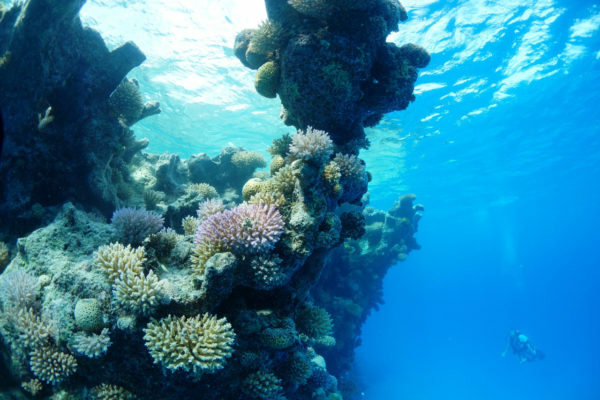 This guest post is submitted by Kirinne Slaughter at the Saint Louis Zoo, and is the second in a 3-part series on their Innovative Solutions Grants+ project. Since our last post, our Zoo ALIVE (ZA) teen volunteers have been hard at work helping Zoo visitors say #byetobags! Successfully building on the lessons learned from the Better Bag Challenge, our teens have developed a campaign that asks visitors to be a part of the plastic pollution solution by switching to reusable bags to help sea lions. The teens designed a reusable bag giveaway, and a pledge that states: “I pledge to switch to reusable bags in order to keep our oceans clean for sea lions & all ocean animals!” Since our official launch on April 23rd, they have asked more than 1200 people to take this pledge. 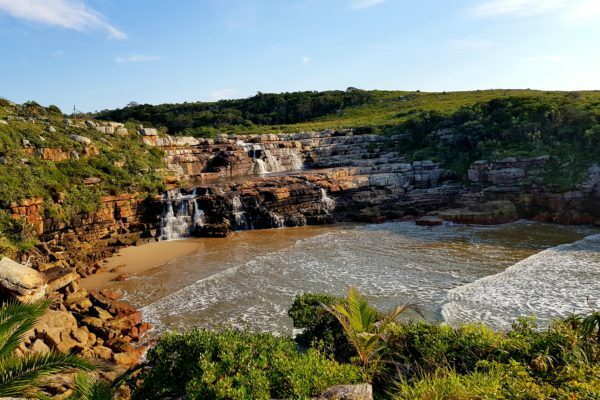 Could they get visitors who took our pledge on-grounds to become active on #byetobags social media, and share the #byetobags pledge with friends and family? How many people could they get to take the #byetobags pledge just through discovery on social media, without the on-grounds bag offer? If people do share the pledge with their friends and family, which method of sharing do they use most? How can we measure all this? These were a lot of questions, and it took a lot of hard work to figure out a way to track the data that we needed to answer these questions. But, with the help of the Zoo’s marketing department and advertising agency, we developed an innovative online pledge taking platform that not only adds a level of sophistication to our campaign, but is the first online campaign of its kind at the Saint Louis Zoo. Have you taken the #byetobags pledge? Do so now, and then help spread the word! The online pledge form can be found here. After taking the pledge, everyone, no matter which pledge form they use, receives an email thanking them for taking the pledge, and asking them to spread the word to their friends and family. The teens came up with three share options to choose from: Facebook, Twitter, and email. No matter which method they choose, an automatic message is provided for them to spread the #byetobags message. 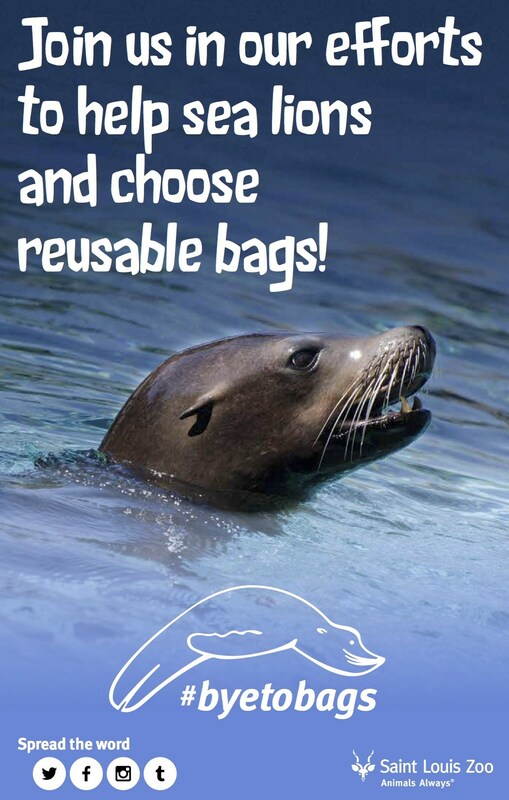 For example, if you were to choose to share via Twitter, the following message will be automatically tweeted from your account: “Keep sea lions safe from plastic bags in the ocean! Join us and take the pledge!" The tweet contains a link back to the #byetobags online pledge page. Because these separate pledge pages generate two separate lists of people, we are able to track whether someone took the pledge on grounds, whether they found the pledge on our social media or on the Saint Louis Zoo website. 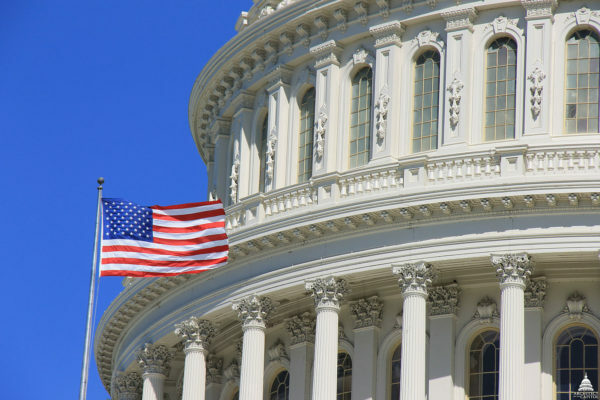 Additionally, through analysis software provided through Google, Formstack and our email service provider, Sharpspring, we are able to track through which social media channel people access the pledge, and what share option people use most often when spreading the message to their friends and family. As we continue to collect data, there seems to be no limit to the number of questions we can answer with this sophisticated software. A total of 732 on-grounds pledges have been taken! Meaning this many more reusable bags are being put to use! Additionally, across all events at which the teen volunteers were presenting #byetobags information, 90% of the people that the teens interacted with and asked to take the pledge, did so. While relatively few of these people have shared the pledge from the email that they received, our Facebook following and reach has been increasing steadily each week, with a total Facebook reach of 17,081 people! We also have seen success on our online pledge, with an additional 168 pledges received with no on-grounds interactions at all, due only to presence on social media and the Saint Louis Zoo website. Since the first posting of the online pledge link on #byetobags social media on April 26th, we have averaged around three online pledges taken per day. These pledges come mostly from people responding to our posts on social media, however we do get pledge takers who stumble upon the pledge while simply navigating the Saint Louis Zoo’s website. Which share option has proved most successful so far? Facebook has been used three times as often as other share options for spreading the word about the #byetobags pledge. Anecdotally, however, our Twitter account has garnered lots of attention from other sustainability organizations, such as St. Louis County Recycling and Coast Plastics. I anticipate that our visibility and networking with these organizations will help us greatly as we continue to spread our message into the St. Louis community at large. Our teens are focusing on modifying our messaging to emphasize the importance of sharing the pledge with friends and family. Additionally, they will be increasing their engagement on social media in an effort to increase the number of pledges taken online, and the number of followers on our sites. Just this past week, we unveiled a #byetobags challenge that asks followers to post a photo/video with their reusable bag. With this challenge we hope to increase awareness and engagement with our campaign. As we continue to interact with visitors throughout the summer, we expect to see these numbers increase, with more and more people joining the pledge through social media, and spreading the word! The whole Zoo says #byetobags! In addition to the primary aspect of our grant, we have also been involved in many other important parts of Zoo culture. Our gift shops have been very involved with the project. They have incorporated signs into their shops encouraging people to choose reusable bags, and ask visitors, “Do you need a bag today?” upon checkout. Additionally, our #byetobags messaging has been integrated into our Sea Lion Show. Before each show, an audio clip recorded by the Zoo ALIVE teen volunteers plays that gives an overview of the #byetobags project. During the show, the trainers explain how important reusable bags are, and give away a #byetobags reusable bag. The sea lions themselves also take part and during the show they put their “lunch” into a prop #byetobags reusable bag. Finally, we are an integral activity at our weekly summer concert series, Jungle Boogie. We have formed strong connections with visitors who attend this event each week, and they have become advocates for our project as they encourage new visitors to stop by our table. An overwhelming majority of our guests have been nothing but positive when interacting with our #byetobags table. They seem grateful for the information, and excited about receiving our help in starting to work towards more sustainable behaviors. Our next steps include continuing to work with the various departments around the Zoo and the Saint Louis community to increase the spread of our message. We will be at an increasing number of events throughout the summer, and new ZA’s have been trained and will begin working with the #byetobags campaign. Additionally, as we continue to analyze different parts of our data, we will continue to answer our research questions as to how we can most successfully amplify an on-grounds ask using social media.